Virtua Fighter 3tb (バーチャファイター3ｔｂ) is an update to Virtua Fighter 3. It was developed by Sega AM2 for Sega Model 3 Step 1.0 arcade hardware in 1997. The tb stands for Team Battle, as the game now allows players to select a team of characters, with each taking it in turns to fight members from an opposing team. Virtua Fighter 3 had originally been planned for the Sega Saturn, however due to the Saturn's vastly inferior graphics capabilities the port was scrapped. Virtua Fighter 3tb, on the other hand, was brought to the Sega Dreamcast as a launch title in both Japan and Europe. The original Japanese Dreamcast release of the game was distributed in a double CD case with a special preview disc of "Project Berkley", which would eventually become Shenmue. Later prints of the game lacked this extra. This is most evident in the Western launch, when Virtua Fighter 3tb debuted on the same day as the critically acclaimed SoulCalibur. Whereas SoulCalibur is considered to have improved during its transition from arcade to Dreamcast, Virtua Fighter 3tb makes noticeable cutbacks in areas, despite being the older and simpler game of the two. This may be attributed to the fact the Dreamcast port was handled by Genki and not in-house by Sega AM2, in contrast to the Saturn releases of Virtua Fighter (Remix) and Virtua Fighter 2. In Japan, the situation was much worse, as the Dreamcast version shipped without any form of two-player versus mode in order to hit the Dreamcast console's launch date. 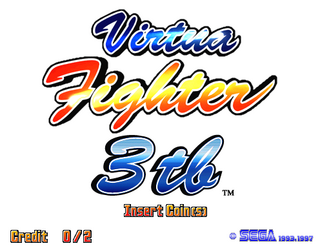 As such, of all the early Dreamcast titles, Virtua Fighter 3tb saw perhaps the most drastic update when brought to the West, with both versus and tournament modes being added over the course of the year as well as a slew of bug fixes (other notable upgraded games include Sonic Adventure, Sega Rally 2 and Blue Stinger). While operating at a higher resolution, texture quailty is often worse for Virtua Fighter 3tb on the Dreamcast, and lighting and fog effects also differ between the two versions. Character shadows also do not always render correctly, as evidenced in stages played on uneven surfaces, such as Pai's where the battle takes place on a slanted roof. Some stages have different coloured backgrounds for unknown reasons. In the Dreamcast port, the character model of Aoi Umenokoji consists of about 7,500 polygons, with her head alone consisting of about 4,300 polygons. In the water stage, the polygon count reaches up to 1.9 million polygons per second, about 32,000 polygons per scene at 60 FPS. Returning to the Dreamcast version of the game as a secret is the so-called "alphabet character", a fighter sharing movesets with the regular cast but constructed out of 3D letters from the name entry screen. The alphabet character debuted in the Saturn version of Virtua Fighter 2 (also as a secret), however here it is more fleshed out, with limbs being spread out across the ground when knocked over. The alphabet character is are made up of a single letter rendered at different sizes (save for its hands) - if hit, the letter changes, becoming the "END" graphic if the player loses a match. A normal player model is loaded if the alphabet character attempts to fight Dural, and this model is also used for the credits sequence. A mode also exists where all opponent players are replaced with the alphabet character (using their moves). Main article: Virtua Fighter 3tb/Magazine articles.